Our recipe for team success? Two-week sprints + great lunches + accountability = an all-in, well-fed team. Since Rival IQ was but a glimmer in our founders’ eyes, we’ve relied on sprint planning to help us set and achieve our company-wide goals. (Spoilers: we’re now on our 168th sprint!) From mapping out new features to planning team events, our two-week sprint planning model helps us stay on track while giving us a good excuse to order in lunch and integrate our work. For a peek behind the curtain, we’ll take a look at how sprint planning works at Rival IQ and why it’s so important to us as a team. I admit, I hadn’t worked at a company that relied on sprint planning before I came to Rival IQ, so here’s a quick primer. We (and tons of other organizations and brands) borrowed the idea from the agile method of team management. It varies from org to org, but for us a sprint is a two-week period of time in which we map out and achieve a concrete set of goals that help move our business forward in a measurable way. Many companies use sprint planning just for their engineering team, but aligning our goals company-wide is really important to us. The process below is critical for keeping us on track, and so is our monthly metrics review meeting, where we look at how the goals we set during sprint planning are affecting Rival IQ’s momentum. If the goal of coming to work is getting your work done (what a concept! ), we look at sprint planning as a way to break up the work into achievable chunks while keeping everybody accountable and collaborating on the regular. The team at a recent sprint planning meeting. Every other Wednesday, you can find our team stuffing our faces smack in the middle of our office during our sprint planning meeting. 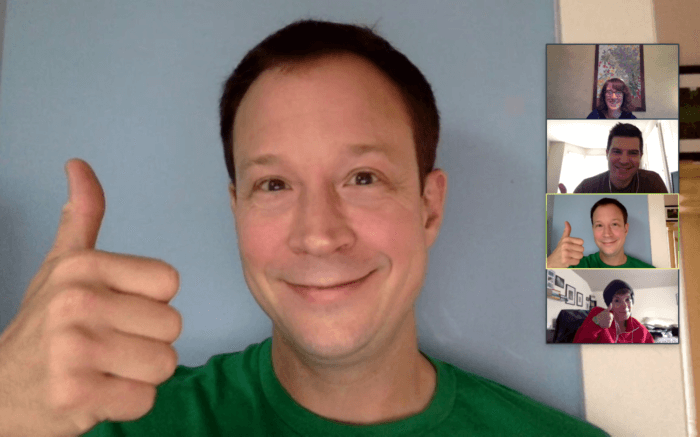 We chat over lunch, spin up any remote colleagues on a video call, and then get down to business. Reporting on the last sprint: Each department (business development, sales, customer success, marketing, product, engineering, and culture) references the goals we set at the last meeting and shares progress and/or roadblocks. We usually leave ongoing/maintenance work out of these reports (like squashing bugs, posting on social, writing these blog posts, etc. ): sprint goals generally focus on larger, often team-wide projects and/or new team initiatives. Sharing our goals for the next sprint: We go around the horn again, and each department shares goals for the next two weeks. Sometimes this means carrying goals over from the last sprint, and other times it means collaborating with other departments or asking for help to achieve a goal together. 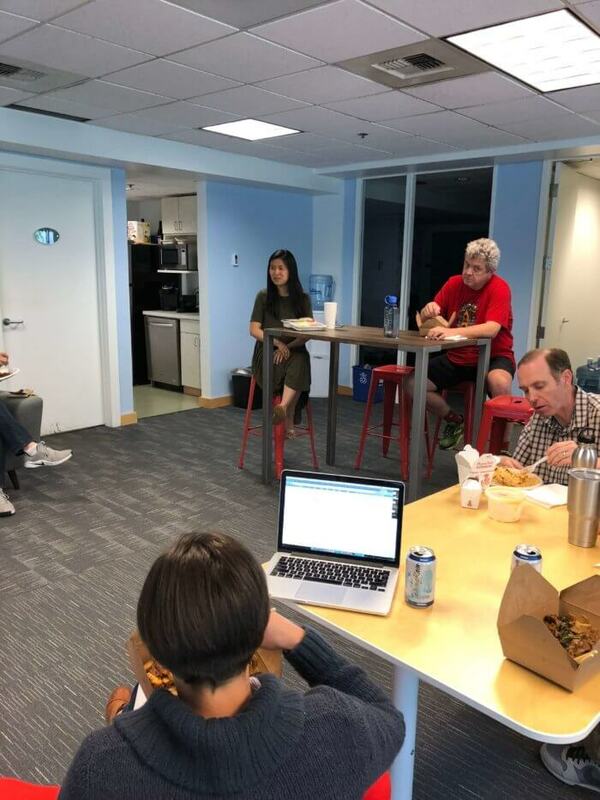 Announcements: We leave a little time at the end of each sprint planning meeting to update each other on engagements, new hires, team member departures, fun team events, and other things everyone should know about. One of the many joys of working at Rival IQ is our commitment to efficient meetings, and sprint planning is no exception. To make this all-hands meeting run as smoothly as possible, teams gather for a pre-sprint planning meeting where we review our backlog of tasks from our last sprint and our quarterly road map to make sure we’re on track with our big-picture goals. We also work together to draft goals for the next sprint. This meeting helps each team construct goals that we feel we can own in the next two weeks ahead of being under the spotlight during the full team meeting. It also gives us breathing room to examine our capacity and select projects that we’re excited about. A pretty average marketing/sales team stand-up. Most mornings, you can find the sales/marketing and engineering/product teams coming together for a few minutes to share what each team member worked on yesterday, what they’re hoping to accomplish today, and anything that’s blocking their work that another team member could help out with. These check-ins are an integral part of sprint planning in that they keep our work moving forward, identify roadblocks long before the end of a sprint, and give our teams a little face time every morning. The sales/marketing team is especially guilty of going over our allotted 15 minute slot because we’re so busy talking about what we did over the weekend or what our families are up to, but that’s a different blog post. Okay, so Rival IQ wasn’t started in a garage, but it definitely spent some serious time in coffee shops and our founders’ living rooms. Sprint planning was an excuse to bring the remote team together on the regular for all the benefits listed above, and one more key motivator: Lunch! Our tireless founders knew that breaking bread (or cheeseburgers, or noodles) as a small team would help galvanize everyone from the get-go, leading to a more cohesive team that was working towards the same set of goals. Lunch also felt like a great way to say thank-you each week for everyone’s hard work in the sleepless initial stages of a new startup. The spirit of Wednesday sprint planning and lunch lives on in our office today, and is a wonderful moment of pause where we all come together to catch up while chowing down. What has sprint planning done for you lately? The chance to share stories: From hires to company updates to one very memorable birth story, being in-person for these moments of celebration and change beat the all-staff email announcement every time. I always leave our sprint planning meetings feeling closer to my colleagues because I know more about what they’re up to in and out of the office, and have a chance to connect about families, kids, adventures, and more. Out-loud accountability: There’s nothing like sharing your team’s upcoming goals with other people who are dependent on you to make it happen. Knowing that your teammates heard your upcoming projects and are going to be asking after them in two weeks is both a diabolical management technique and an incredible motivator ?. Celebrating success together: Retrospective (where we all have a chance to thank our colleagues for saving the day) is my favorite part of sprint planning–I love shouting my coworkers’ amazingness from the rooftops, and learning about the behind-the-scenes magic that happens in other departments to keep the trains running. Having dedicated time to share these successes helps us all stay involved in the whole team’s work while reinforcing a culture of gratitude around the office. We know that all agile-based companies do sprint planning differently, but we wanted to shed a little light on how it works around Rival IQ, and why it works so darn well for us. And if you’re looking for us around noon on Wednesday, you know exactly where to find us: parked in the middle of our office talking goals, food, major life changes, and so much more.